Concerto No. 3, K. 447 (for Horn in F and Piano Reduction). Composed by Wolfgang Amadeus Mozart (1756-1791). For French Horn. Brass Solo. 32 pages. G. Schirmer #LB2050. Published by G. Schirmer (HL.50485605).ISBN 0634081748. 9x12 inches.Formerly released as a collection in one volume (50481735), these individual concertos are now available to musicians at affordable prices. 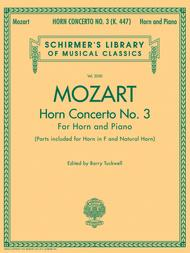 The editions are by Barry Tuckwell, the most promiment French horn player of his generation. Parts are included for both Horn in F and Natural Horn.